Whether you are an individual or a family, you need top-notch skips to dispose of the waste that you generate. If you have the habit of piling up things even if you do not need them, there comes a time when you end up collecting a lot of unnecessary things that clutter your home like anything. One of the best ways to eliminate those unwanted items is to hire quality skips from a reputed skip hire company. It’s the only way to dispose of residential waste responsibly. You can’t afford to throw your domestic waste anywhere because that can lead to air, soil, and water pollution. Apart from that, your waste contains a lot of recyclable items which should not end up in a landfill. If that happens, it will not only end up overcrowding the landfills but will also lead to a lot of wastage. There is little doubt that we have a lot of fun decorating our homes for Christmas and New Years. We throw multiple parties for our friends, colleagues, and relatives, but when the celebrations are finally over, most of us find our homes in an untidy state. So, if your home is also dirty and you want to restore it in its actual condition, you need to clean it thoroughly. And when you declutter every nook and cranny of your home, you end up generating sufficient waste for which you should hire quality skips. If you are cleaning your garden after a long time, then your garden cleaning project is going to generate a lot of waste, and you must hire quality skips to eliminate that waste. In other words, when you trim all the dead stems and uproot dried trees from your garden, you end up generating a significant amount of waste, which you must dispose of responsibly. And to eliminate that waste responsibly, you need the right size skips. Whether you are planning to renovate your kitchen, washroom, or driveway, you need skips to manage the waste that generates from your renovation project. Renovation projects consist of two essential phases. During the first phase, building professionals have to demolish the part that needs renovation, which generates waste that includes concrete and brick, metal, wood, and asphalt, etc. And during the second phase, new construction takes place, which again generates waste. You can’t dispose of your renovation waste anywhere. Therefore, it’s better to rely on skip hire company for its disposal. A skip hire company uses environment-friendly techniques to manage your waste. They segregate all the recyclable items from non-recyclable ones to reduce the wastage. Apart from that, they make sure that they dump your waste only into an authorized landfill. You also need skips when you move into a new home to dispose of all the unnecessary items that you don’t want to carry with you. Whether you talk about your child’s old bicycle, a damaged rug, rundown furniture pieces such as stools and sideboards or torn clothes that no longer fit you, you need skip hire solutions to get rid of them. 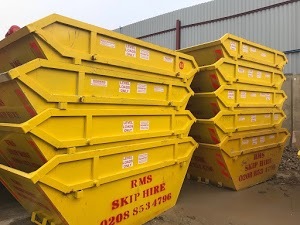 So, if you are from London, and you need reliable skips to manage your domestic waste, don’t hesitate to approach RMS Skip Hire.